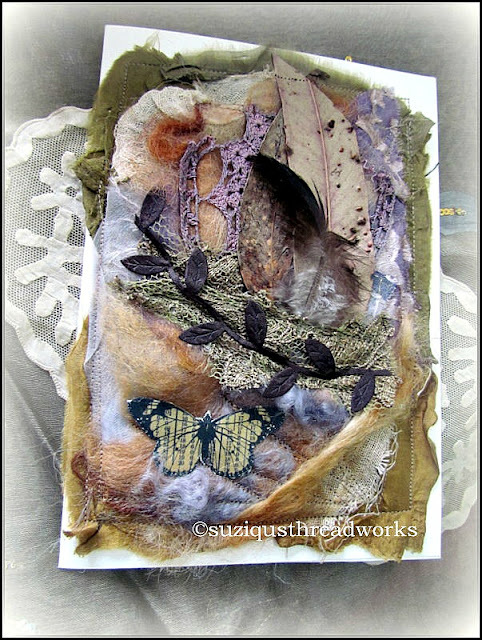 Suziqu's Threadworks: The Birth of Spring brings New Inspiration! but we also have a pretty green/pink combination. 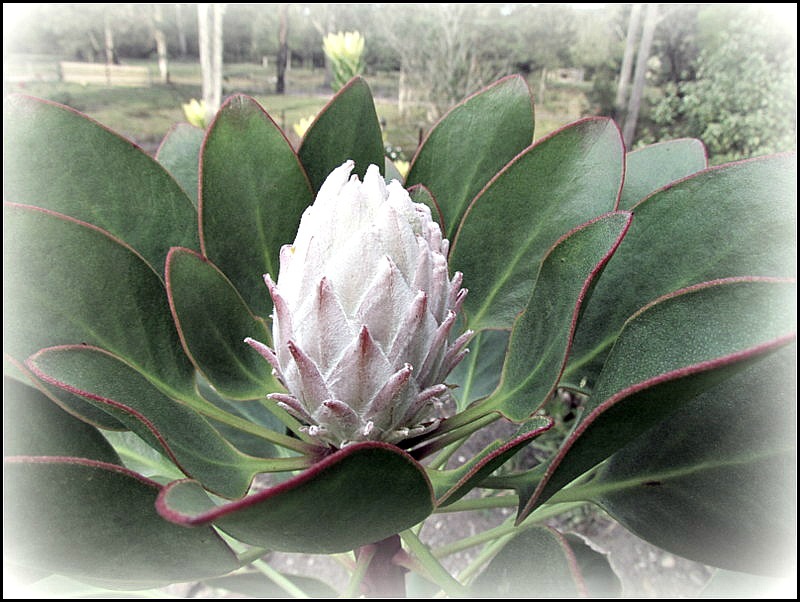 Before very long this King Protea will be in full bloom also. The flower itself is the size of a small dinner plate! 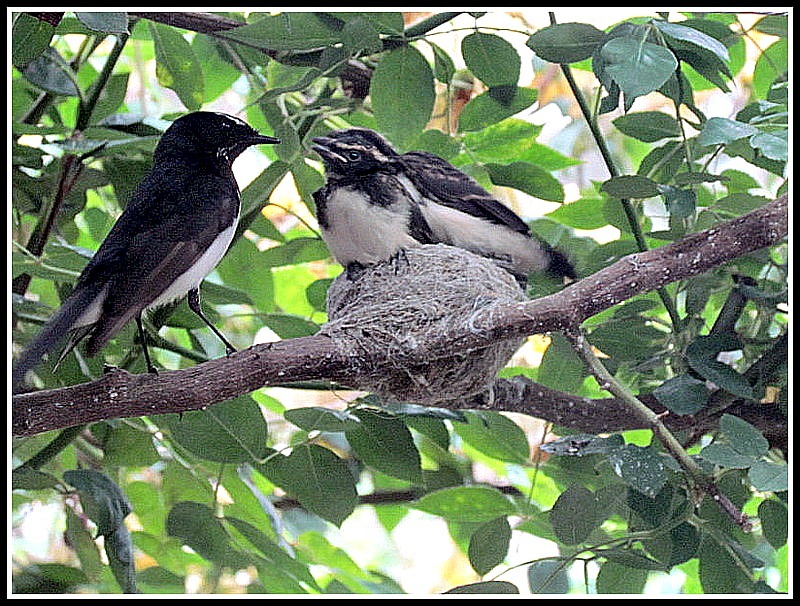 Last Spring these baby birds "Willy Wagtails"
to prepare a nest once again! last season was almost deafening. has left on the ground to be used! might like to share it with me! Have a really inspiring and creative week! 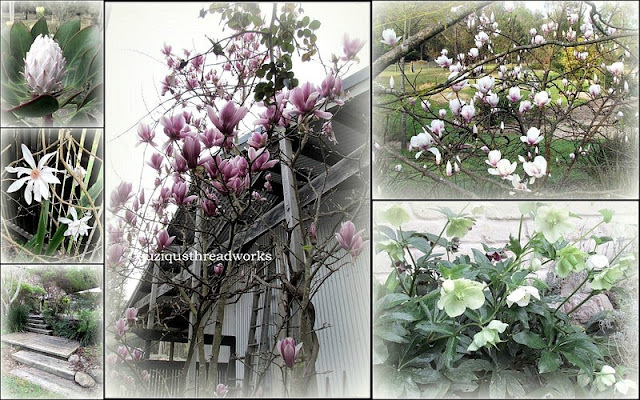 Hello my dear Suzy, Your garden looks so springlike with the magnolias and hellebores. The birds are such cuties. It's wonderful that the couple returned to build a nest again in your tree. With all that beauty in your garden, it's no wonder you got inspired to create those most beautiful cards. 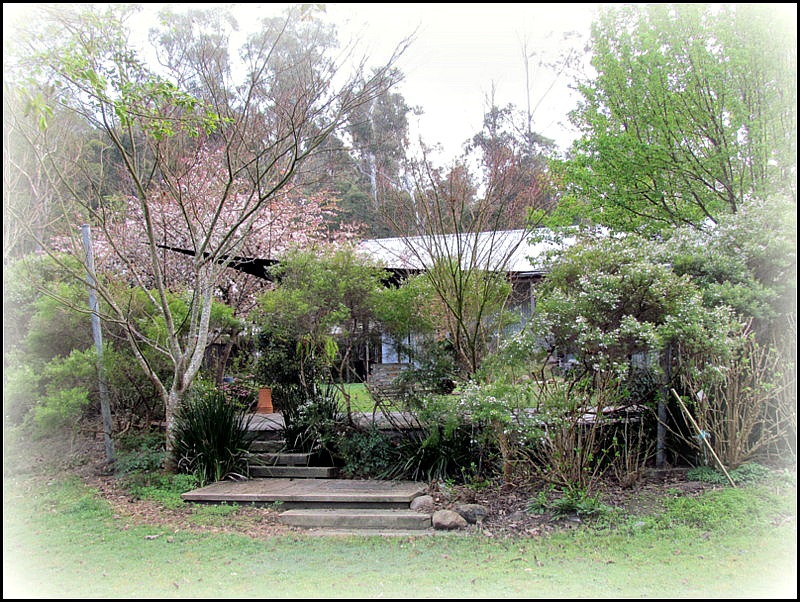 Your beautiful garden is just bursting with Spring - I miss having a magnolia tree - sadly I haven't got room for one in this garden! The winter roses make a beautiful carpet both in the garden and under the trees - they have such delicate blooms in beautiful murky colours. I've been waiting for this Springtime post from you and I'm not disappointed. 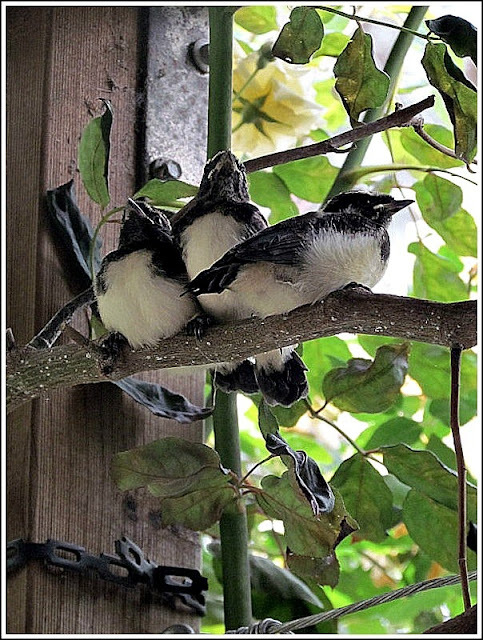 How lovely your willy wagtails have returned - more babies to look out for to. You truly are blessed, both by the beauty that surrounds you and by your amazing talents. The photos are stunning and the beautiful pieces you created are out of this world gorgeous!! Your cards are beautiful and incorporate such lovely colours. Love the Protea ... wish we had them here. What a beautiful post today! For you Spring is back! I love your Hellébores, specially the purple ones, and I'm very happy your birds are back. it's so marvelous to see newborn babies in nest. You've a beautiful garden, good for create! Dear Suzy - so much beauty - waw!! And your cards are so fantastic!!! Here it is soon fall but we have had a lovely summer. Wow Suzy, what great photos. Your cards are so unique and beautiful. You live in a beautiful place. Dear Suzy ~ What a lovely post. All of that beauty surrounding you is definitely inspiring and your cards are wonderful. Your garden is beautiful and lucky you to have that bird's eye view - literally! I love what you did with natures "findings". 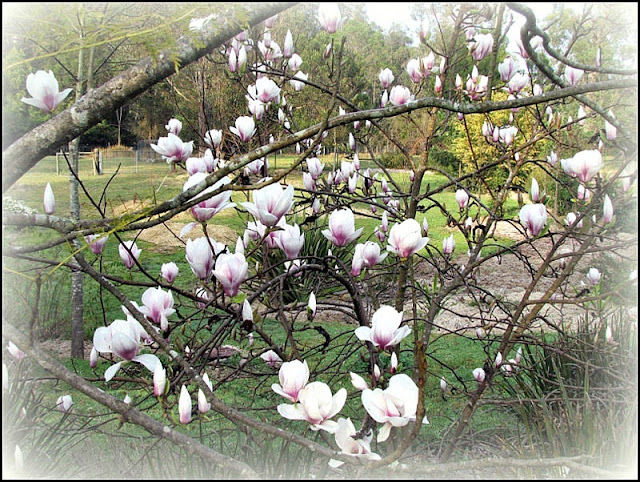 Thank you for sharing your beautiful spring photos (here it is fall) and cards! 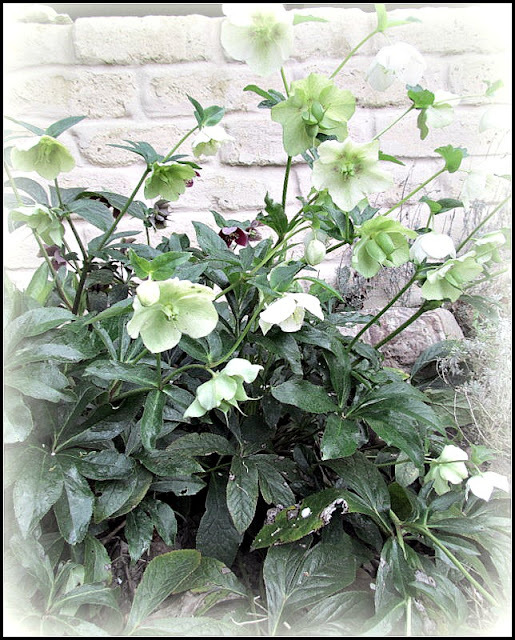 I love hellebore's and have a pink and green one. I would also love to have a plum one too. Enjoy your sprin! Mother Nature is displaying all her beautiful glories for all to see in your delicious garden. Dear Suzy, such an incredible source of inspiration is there for you on a daily basis, I am in awe of it all and also those cute birds. Your stunning collage is a beautiful reflection of what you see outside your windows. Oh my goodness, your garden is already so filled with beauty and adorable flowers. And how wonderful that your Willy Wagtails are returning this year, to bless you and Jeff with a new nest full of beautiful eggs and later birds !! 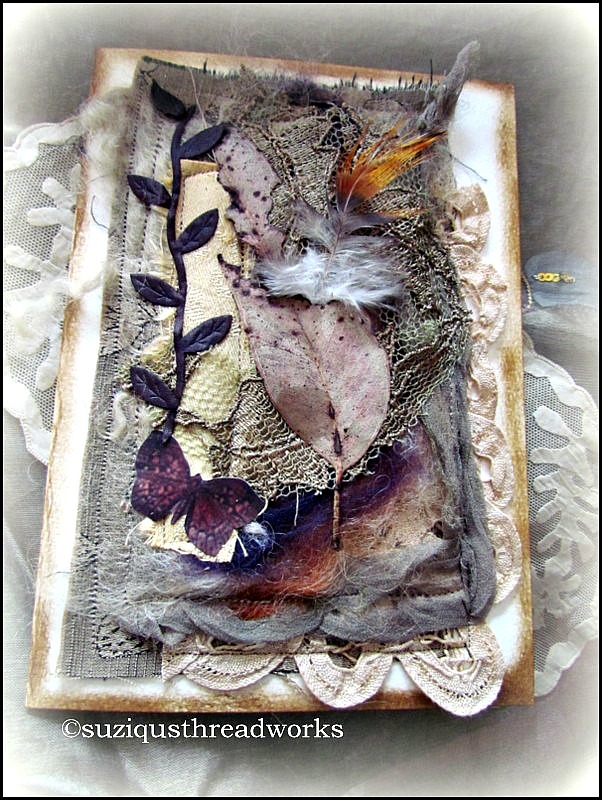 Dearest friend, your cards are stunning,- I love the leaves you have used, they are looking so beautiful there with all your amazing laces and the feathers and wool. 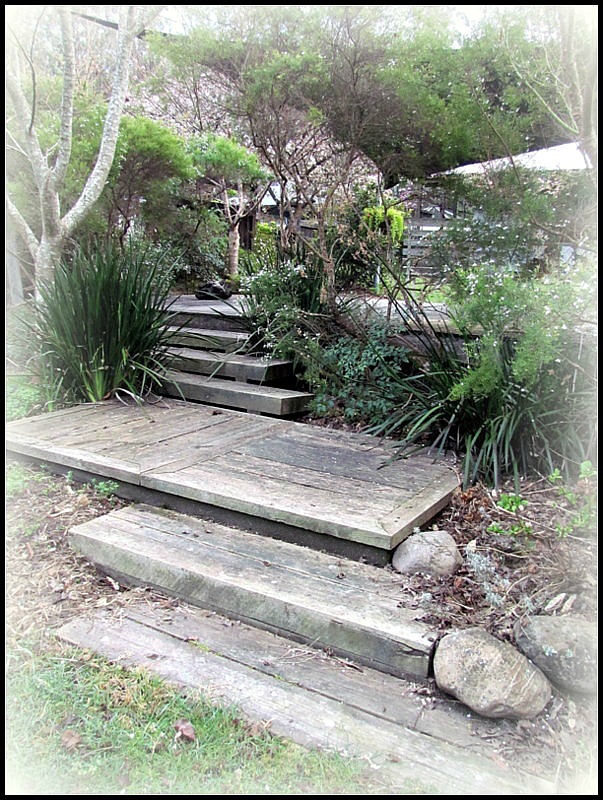 As alwayes you are doing magic with your many components from your garden and your studio!! Sending you good morning hugs and kisses, and wisches for a beautiful new day. Great cards Suzy and garden. Love the magnolia - I bought a baby one this year but something has been eating it. Your garden is delightful Suzy as are your gorgeous cards. We have an amazing number of daffodils this year, such a brilliant reminder that it's spring at last. I wish you and your beloved ones a merry spring season full of optimism and hope! 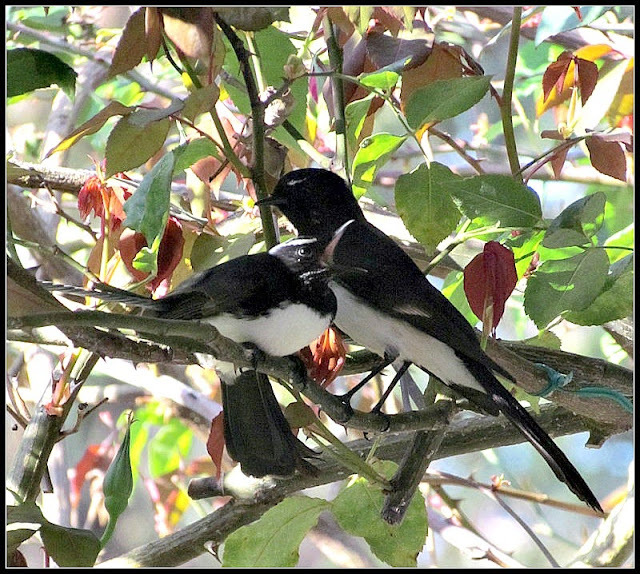 Your lovely little birds remind me a lot of our tree swallows...don`t know if you have them where you are. How I wish we were coming into spring here - instead we`re heading into the most dreaded of seasons (in my mind). I absolutely hate winter and would quite happily hibernate the whole time. Oh - and beautiful nature creations, btw. As much as I get tired of winter and summer at the end of each season, I would never want to live anywhere without the change of season. For me, the nudge of spring and the yawn of fall are worth every moment of sizzle and freeze. Lovely photos!! Gorgeous and beautiful!!! Spring is rebirth isn't it? How truly amazing our seasons are reversed, giving us all a look at spring in advance! Oh Suzy, I think you must live in paradise, I have never seen such wondrous and beautiful things! My heart is beating faster just looking at your photos, especially the birds, oh, the gorgeous birds! 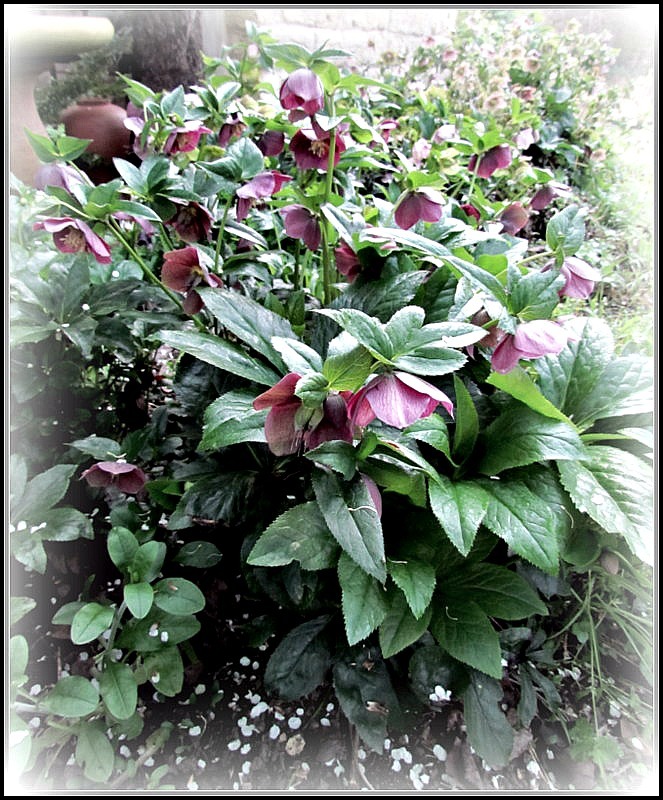 But the flowers, the hellebores..., I can't decide, if I lived there I would be overwhelmed! Life is Grand! Suzy, the nature cards are so fantastic, love them. 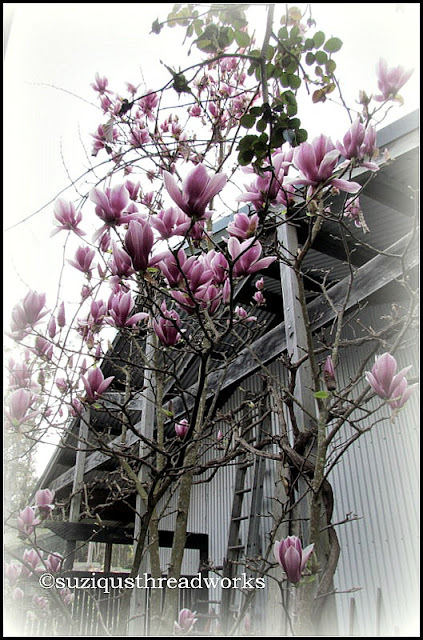 Spring is such a wonderful time of year, hope you will be enjoying everything single thing about it. deine Fotos sind so herrlich anzuschauen. Bei uns fängt allmählich der Herbst an. Seid zwei Tagen ist Monsun, und die Sonne erscheint nur kurz. What a beautiful garden! Lucky you. I love your cards. My family gets a laugh at all the things I collect in nature. I just love seeing pictures from your garden especially the ones that are different then ours in America. Enjoy your spring as we here go into Fall. I know exactly what you mean, blessings abound! Happy Spring, my dear Suzy. Your Garden looks so beautiful and the cards you created are just stunning.Have a wonderful weekend and I will be in touch soon. Happy Spring Suzy! Your garden is so full of promise already. I hear in your post how much you love it all. I loved seeing the birdies! Your nature inspired cards are glorious! Oh my! 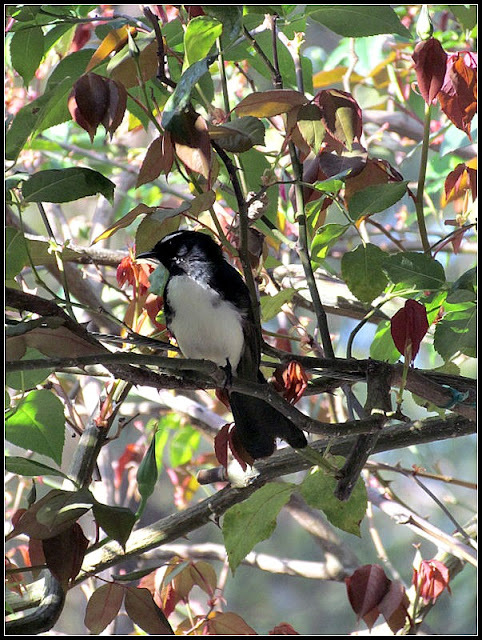 YOur cards are amazing and your gardens and bird shots are sublime!! i do hope your birds chose a spot for their nest where you can watch and take photos! !